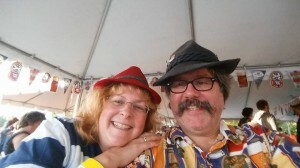 I wasn’t planning to blog about last night, but we had a really great time at the First Annual Rauetoberfest. The Raue Theater in downtown Crystal Lake offers a wide variety of entertainment for different occasions. We normally attend the Make Your Messiah event in December. You bring your songbook and can become part of the choir performing Handel’s Messiah from your seat. If you love choir music, there is the ultimate. 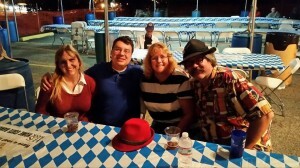 Last week, I received an email from Raue about their first ever Oktoberfest event that would be held on September 26 and 27 in downtown Crystal Lake. 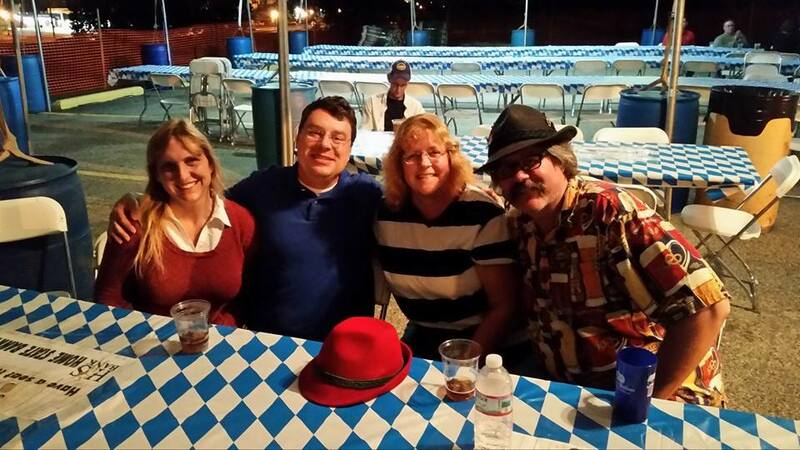 We have been looking for Oktoberfest events since the DANKE Society stopped holding theirs in South Elgin. That was sad to see them close up their event. However, there weren’t enough young members to carry it on. We’ve gone to some other events, but they just weren’t the same atmosphere. Then I noticed later in the week that a former colleague and his band were playing at the Rauetoberfest. It would be an opportunity to see Mike and his band and see how this Oktoberfest was. Being the first one, it meant there was a chance it was slow and not up to par with what we expected. It did have the advantage of being really close to home though. I let Rick decide if he wanted to go with us. However, his attendance meant that I could have a beer as well. I only have a couple of more months to abuse this privilege before he leaves for Michigan. He finally relented and agreed to be the Designated Driver of the evening. We arrived in downtown Crystal Lake about 5:00 PM. Mike’s band, What About This, was starting at 5:30. There would be time to scope out things. I thought the event was behind the theater, but I was wrong. I turned out to be just up the road from the downtown area. There is an industrial site that is currently closed. This was the real location. Rich and I walked over while Rick went back to move the car over to the parking lot on site. As we walked up, we could hear cowbells ringing. Now what did that mean? There was a German band on stage along with a tuba player and an accordion player. This had definite prospects of being at least good German music. There was a pretty good crowd hanging out under the blue and white tent. Blue and white! Bavarian colors! There was another good sign. As we were waiting for Rick to get into the grounds, we spotted Mike and his band moving their equipment out toward the stage. We walked over to grab a few words. We hadn’t talked to Mike in a few years. He left the Big Mot to go into the mortgage business with another former Motorolan. They had done very well. It seemed like everyone at Motorola with a mortgage need went to Milestone Mortgage. We talked for a few minutes and then let Mike get on with moving equipment to the stage. We got tickets for food and beer. The food was brats, hot dogs, pretzels, and other odds and ends. Not much, but it is a good start. The beer wagon was promising. There was Hacker-Pshorr and Spaten. Two pretty good German beers. That should do the trick. For a price, you could get the souvenir mug as well. We got our food and drinks and move to the front of the tent so we could see the stage across the lot a bit. It was a great view and we were right behind the sound booth. This was where all the action was. We watched What About This set up their equipment and run through sound checks. They adjusted the lights with a mic stand to hit them on their spots. You want to make sure you are seen well. The band finished up and kicked right in. They were billed as classic rock, but there seemed to be a lot of 80s and 90s music in there. Mike had the Frampton set up for his guitar and of course, they had to play, “Do You Feel Like I Do” just so Mike could plan. They did a pretty good job for guys who just get together to jam. Mike says they only play a handful of event over the year. They brought some of their fan base with them though. Next up, the Musikmeisters returned to the stage. Yep, there was a tuba up there. No, correction on that. We were informed this is a sousaphone and not a tube. You have to use the German term for it. The guy on the end was holding an accordion. We were set for music. They started off the set with “Ein Prosit.” This is the traditional beer drinking song. We sang German songs and drank some beers. At one point, the entire area for the event was full of people! It was great! There were little kids under 5 dancing to the music. The German band was very entertaining. After their first set, they traded out the percussion guy for a guitar guy. From there, they were adding old Rock and Roll songs in here and there. At one point, the tuba was playing old Rock and Roll! I know, I know, sousaphone! I drink slowly these days. I just don’t have what it takes to keep up. Rick and Rich were giving me a hard time about drinking one beer for a long period of time. As Rick put it, “You’re going to have to step it up to enjoy Germany next year, or it’s going to be a total waste on you. That’s not totally true. I can still enjoy it without having to drink a lot of beer! It was getting close to 9:00 and Rick was ready to move on. We were working on finishing up our beers. Someone stopped in front of our table. I thought they were asking Rich a question. When I looked up, it was David and Heather White! David and Rich are cousins. Their grandfathers are brothers. We’ve known David and Heather for the last 20 something years. It was a total surprise to see them. They went off to get food and drinks and came back to join us. David and Heather have 5 kids. I had to ask where they were. Apparently, it was a good excuse to leave them at home and come out by themselves. We chatted off and on around the music and got caught up. We ended up staying another hour to talk. Then the beer and the chilly evening were getting to me. Time to go home and setting down for the night. We wished David and Heather good night and moved on to the lot. Rick drove us home and we discussed the evening. Here’s to hoping there is a Second Annual Rauetoberfest! Joy and Rich in their German hats enjoying Oktoberfest. It is a working Saturday. We replaced the back door from the deck into the kitchen. Last winter, I noticed that the winter seal had failed. That meant that heating was escaping and maybe the house was a little bit colder. That probably wasn’t the case, but I had my mind made up to replace the door before this winter. Today was that day. A couple of weeks ago, Menard’s had the door I wanted on sale. I drug Rich down there to look at it and be sure. It was definitely the door. We found someone with a lift to get the door down from the shelf. Loading up the truck with my prize, we took it home so that it could sit out in the garage until we had the time to take the old door out. We needed the time because we were worried about what might be under the door. A couple of years ago, we had a nest of wasps start up behind the siding. It took a bit to get everything sealed off so they would die. I was pretty sure that meant we also had moisture and rot under the door and maybe up the side of the door. Taking it apart was the only way to tell what was back there. 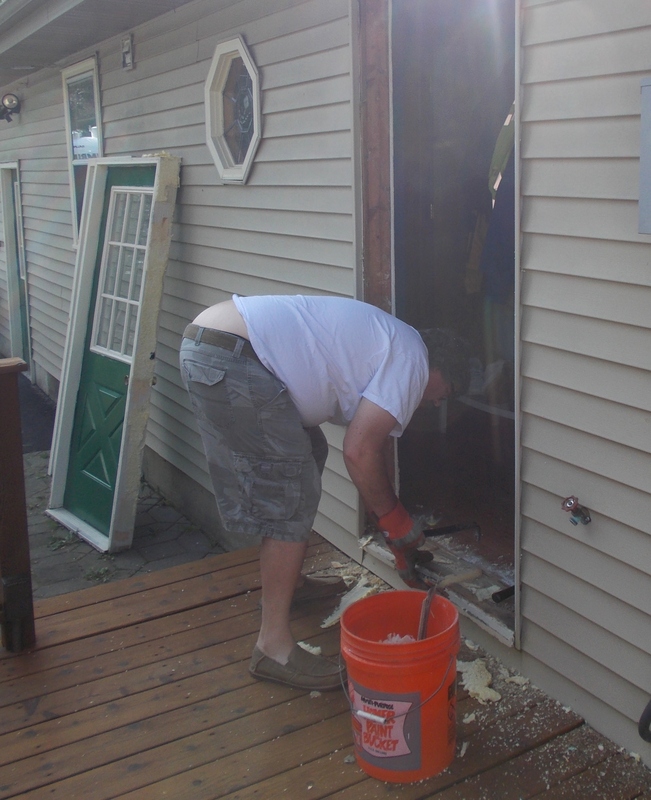 Today was the day we peeled back the siding and take out the old door. But first, Sascha decided to dig this morning. She picked the flowerbed over an old tree stump to dig up. She had carved away the dirt from one end of the stump. I swear, I could rent her out to excavate things. She can move so much dirt with those massive paws. It didn’t help the neighbors that Rich was out there yelling at her at 8:30 this morning. Big question was what did we need to repair before slipping the new door into place. It turned out better than I had hoped. There was minimal damage. We didn’t even find the nest that I figured was under there. 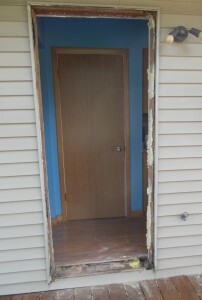 There were some missing pieces of wood to help support the threshold of the door, but that was all. I was the muscle today and Rich was the brains and some muscle. He cut the nails and insulation around the frame so we could lift it out. The door popped out without much trouble. We got it off the deck and leaning again the house. After inspection and determining the next steps, I scraped away the old sticky stuff from the frame and cleaned up the dirt. Rich measured and cut the supporting wood for the frame to reinforce the opening for the new door. There were a couple of areas that required some chiseling to get things level. Then we hoisted the new door into place for quick fit. Nice. It worked well. Then we took it out of the opening to prepare for the installation. Now the entire time that we are working out there, bees were searching the outside of the house for places to build this year’s nest. It was like working with a squadron of drones always looking over our shoulder. With the old door out, they were easily slipping into the house. Rick was called into action to kill errant bees trying to move in. 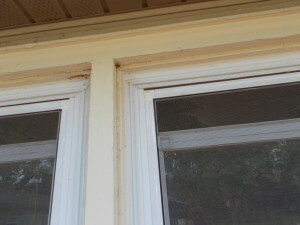 By the time the new door was in place and the house was sealed up again, we counted maybe 25 bee kills. I should buy a stamp with a bee on it so that we can register our kills on the side of the refrigerator or something. It was hot outside and Sascha was wanting in. Unfortunately, I didn’t have a good way to make her stay in without a door on the back of the house. She was forced to hang out until Rich had the door secured in place. She was quite happy when she got the all clear to come in. After a lunch break, Rich settled in to finish the door and get the new lock put on. The other big issue with that door was that the deadbolt and the handle didn’t use the same key. The maid service was always locking the handle on their way out and no one had a key to open the door! 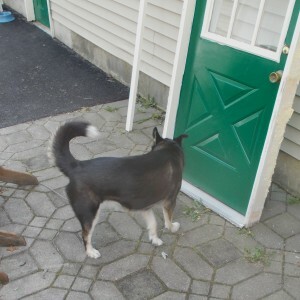 This replacement prevents us from getting locked out of the house. Two issues solved at once. Once the door was in place and secured, the impending rainstorm hit. Rich had been watching the skies very warily. He wasn’t sure he was going to get things sealed up before the rain came in. Luckily, he beat it by 15 or 20 minutes. All the other work he needed to do was on the inside. I just wonder how long it will be before the trim goes up around the door. But before that happens, I really want to paint the door on the inside and outside. On the inside, it will get a nice yellow to match the colors in my Key West kitchen. I didn’t keep the paint swatches, so I’ll be flying a little blind on matching up the colors. The outside will get a dark green to match the rest of the door. By then, I had learned my lesson and kept the original swatch so I could try to match the color. Hopefully, I can get that all painted in the next couple of weeks. For now, I can tell Old Man Winter to do his worst. 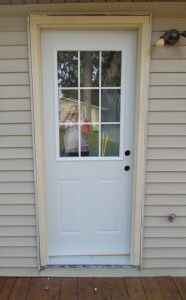 I have a new door on the back of the house! But really, I was just kidding about that statement on doing his worst. I don’t want him to even coming closing to throwing anything like that at me or my house. Could it be 65 all winter? Please? BTW: I did get stung while I was cleaning up the rough opening. The old door is out. Ready to prep for the new one. One of the squadron of bees. Sascha checking out the old door. 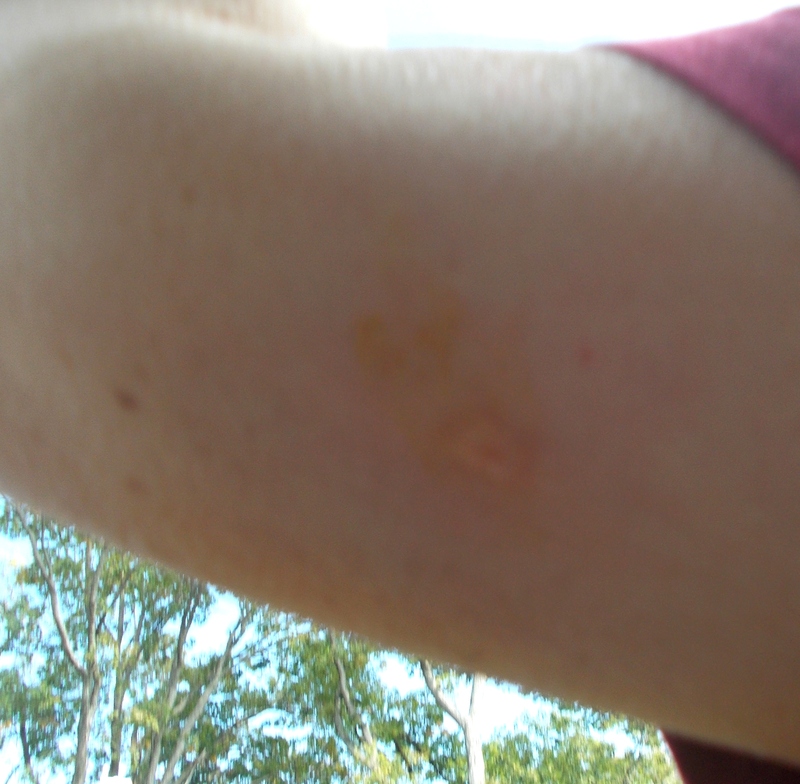 Yep, I got stung by one of the bees. Rich working on the rough opening before we set in the new door. 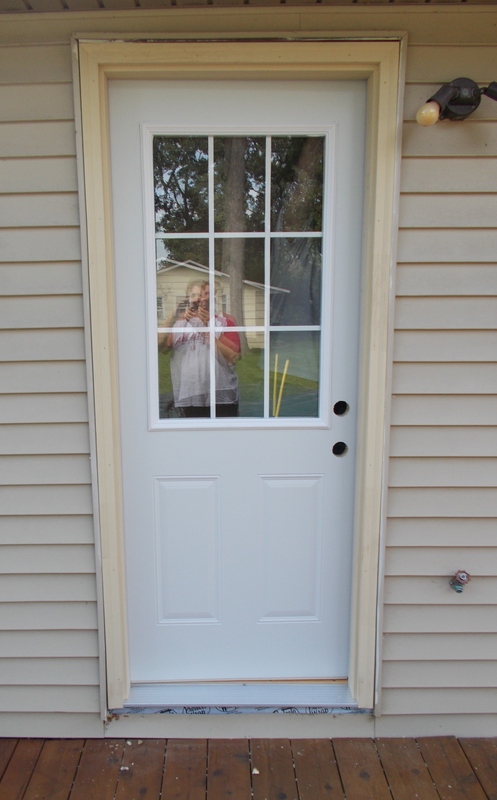 New door is in. Time for the locks. 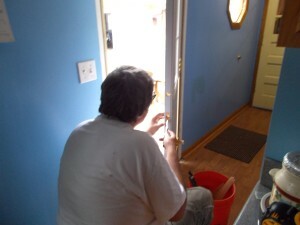 The master lock installer showed up in good time to finish the job.